Do not confuse a native slider population to an invasive population. Where you live will play a role in how effective your pond will be. If you live in an area where there are native populations of wild sliders, then you should have little concern about weather conditions. If you live in areas where it is slightly warmer or cooler than a slider's preferred temperature range, you may still be able to have a successful pond provided there is enough shade, water heating and water depth. A submersible water heater is a necessity and inexpensive safe guard to prevent unexpected cold-water temperatures. If you reside in an area that experiences cold winters, you should be prepared to bring the sliders inside during those times. It is extremely difficult and dangerous to hibernate RES in captivity and never recommended here under any circumstances. In addition, artificial ponds usually do not have the depth and materials that allow for successful hibernation. It is not recommended to attempt hibernation since RES function well without having to hibernate. And since your turtles may not be outdoors when winter arrives, you may want to take measures ensure that your pond, heaters or filters do not become damaged during this time. Turtles have inquisitive personalities so expect them to roam around their provided area. Obviously, an outdoor pond would not be under constant supervision, which is why it would require the ability to prevent any escape and keep potential predators out. A low fence or brick wall is a good choice in making sure that your turtles will not be able to climb out or burrow under. Avoid any material on the ground and fencing that might get a RES caught or cause an injury. A screen covering will be beneficial in protecting your turtles from predators that are adept at climbing or flying. Smaller RES are especially vulnerable, and a basking one might easily get snatched. Ponds in wooded areas might require greater protection. Birds and dogs are potential predators while raccoons are aggressive ones. Live plants help oxygenate the water as well as help remove contaminants such as nitrates. They offer shade in the water and help decrease algae growth. Sliders may use the plants for hiding and nibble on them when in between meals. 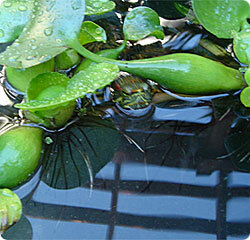 There are many varieties of aquatic plants (floating and submerged) and marginal plants that may be considered. Aquatic plants float freely on surface and some submerged plants may be partially rooted. 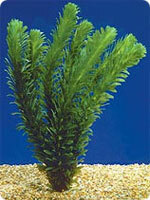 Marginal plants are rooted in the substrate or in special containers underwater. Aquatic plants that are safe to use and which may be eaten are Amazon Swords, Anacharis, Duckweed, Nasturtium, Water Hyacinth, Water Lettuce and Water Lilies. As with any tank, the larger the pond, the better it is. Pond designs offer more variety that brings wider lengths and depths compared to aquariums. Depending on the type of pond you are establishing, you may want to have the pond raised a few inches to prevent flooded materials from flowing into the pond. Stones can be used to help create a border for this area, allowing easier access into the pond and partially removing debris on the plastron. Custom made ponds can offer inclined bottoms that allow easier exits as well as access to shallow water. While the basking area should receive a good deal of sunlight, other parts of the pond ought to have a permanent shade. Multiple basking areas can be made and different types should be considered. Smooth, flat rocks and logs may provide more natural areas for basking. Aquatic plants such as duckweed, water hyacinth and water lettuce can provide some additional cover and privacy. A lack of a waterfall or fountain might require an aerator to increase the oxygen levels in the water.